Beth and Andy began dating in 2014 after meeting online. During a trip to Breckenridge, Colorado to visit Beth’s family, Andy proposed to her on an overlook above a beautiful lake. After researching local weddings they decided on a destination wedding, partly because they had family spread out, from Colorado to Chicago. It sounded exciting, and as they learned further, more affordable too. Beth calls herself a “research queen” and after she sifted through reviews and multiple travel agencies online she landed on Destify. She liked that her agent Candyce had a quick response time. Together they found affordable resort options that also matched the level of quality Beth was in search of. Beth said, “Having the coordination at no extra charge lifted a huge burden.” Destify also coordinated all of the guests’ travel and room accommodations, and even transportation, for a group that extended beyond 70 people. 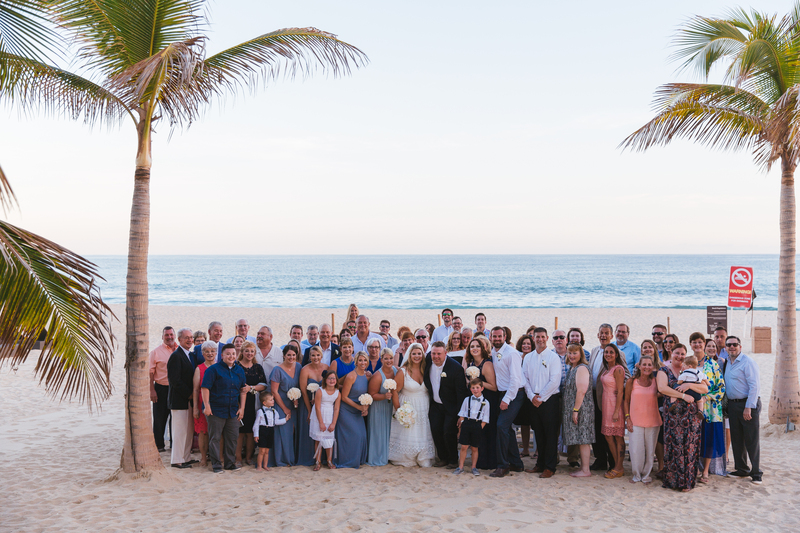 Beth and Andy chose the Hyatt Ziva in Los Cabos as their all-inclusive resort, which features a central location and striking views of Mexico’s west coast. The couple said the resort was very accommodating once the wedding planning began. They were able to use many of their own decorations, from napkins to stuff for a welcoming table. Beth shipped items to the resort beforehand, which was a simple process. The couple had their ceremony at sunset on the gorgeous beachfront. Beth said, “The ceremony was so easy and so beautiful.” After the ceremony, the couple hosted a cocktail hour and private reception at the adults-only pool that extended well into the night. The reception featured a huge buffet and DJ, and everyone had a great time. A majority of the guests stayed for over 4 nights each, which meant plenty of time to spend together in between wedding festivities. The large pool complex became a natural meeting point throughout the weekend and was perfect for the large wedding group. The couple both agreed that their entire destination wedding was a wonderful and stress-free experience. Beth’s advice is to think about a resort and how it would work for your guests. They loved how easy everything was, from coordinating travel to once on the resort grounds. All in all, the wedding proved to be a vacation that created tons of memories, with none of the stress of a typical wedding. The most memorable part was being with my whole family across multiple days.